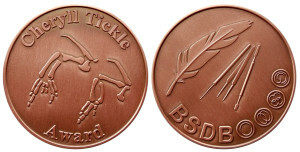 As reported previously, the BSDB has introduced the Cheryll Tickle Medal, awarded annually to a mid-career, female scientist for her outstanding achievements in the field of Developmental Biology. 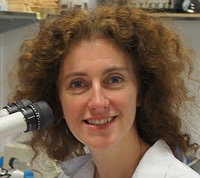 The BSDB is proud to announce the inaugural awardee Prof. Abigail Saffron Tucker who received the medal today at the BSCB/BSDB Spring Meeting 2016 where Abigail gave her outstanding and memorable Cheryll Tickle Award Lecture (soon be available on the BSDB YouTube Channel). To read more about Abigail, please download the BSDB Newletter 2015 or go to the post on The Node. On this occasion, for the first time the actual medal was revealed, which was designed by Andreas Prokop and Megan Davey in discussion with Cheryll Tickle. It shows the famous digit aberrations that occur upon transplantation/manipulation of the zone of polarizing activity (ZPA) or implantation of beads soaked in retinoic acid or sonic hedgehog (for details see Towers & Tickle, 2009, Int J Dev Biol 53, 805ff.). Cheryll performed much of this work in chick as illustrated by the feather on the medal’s flip side, which also shows the typical tool set required for experimental operations and the BSDB logo depicting in ovo development from egg to embryo.